Last night, there were reports that Facebook Messages from Zuckerberg and other Facebook executives sent to users were mysteriously gone. Users don’t have to ability to delete sent messages, but those at the top of the platform did so anyway, leaving the received messages intact. The timing coincides with all the criticism that Facebook has gotten along with the Cambridge Analytica scandal. This kind of erratic action was seen as a breach of trust between Facebook executives and its users. In fact, Facebook confirmed to Tech Crunch that it did indeed delete some messages after Tech Crunch reported that it had email receipts as proof that messages were indeed deleted. In response, Facebook revealed to Tech Crunch its plans to launch feature to delete sent messages for Facebook users. According to Facebook, after the 2014 hacking of Sony’s emails, the company set up “a number of changes to protect our executive’s communications. These included limited the retention period for Mark’s messages in Messenger. We did so in full compliance with our legal obligations to preserve messages”. Facebook didn’t elaborate on how the feature would work and said the feature is still being planned. Facebook explains that it already offers a timer function that users can use to set messages to delete themselves after a specified amount of time. This feature, however, is only available to a conversation if it is started in “Secret conversation”. The thing is, Zuckerberg and Facebook executives deleted messages from regular, private conversations with users, so some are uneasy that they were deleted without notice or discretion. Perhaps the announcing the unsend feature is a way to soften the severity of deleting messages from users conversations without consent or notice by making it look like they were testing the feature. It was only until Tech Crunch told Facebook it had proof that it deleted messages that it actually came forward with its plans to launch such a feature. 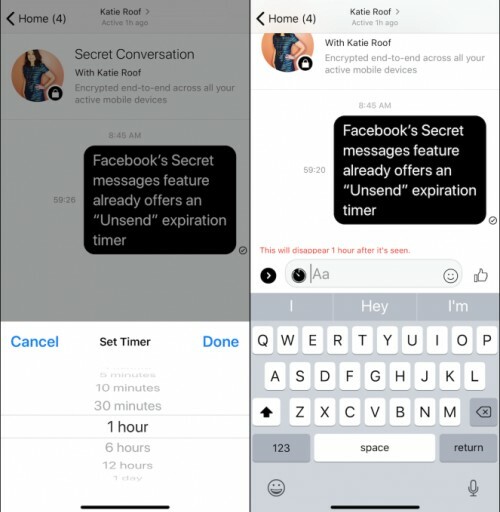 Are you looking forward to a feature for unsending Facebook messages? Do you think Facebook Messenger will be the same if unsending messages becomes a common feature?